Japan has released Average Cash Earnings YoY and the US will publish Balance of Trade and Nonfarm Productivity QoQ Final. 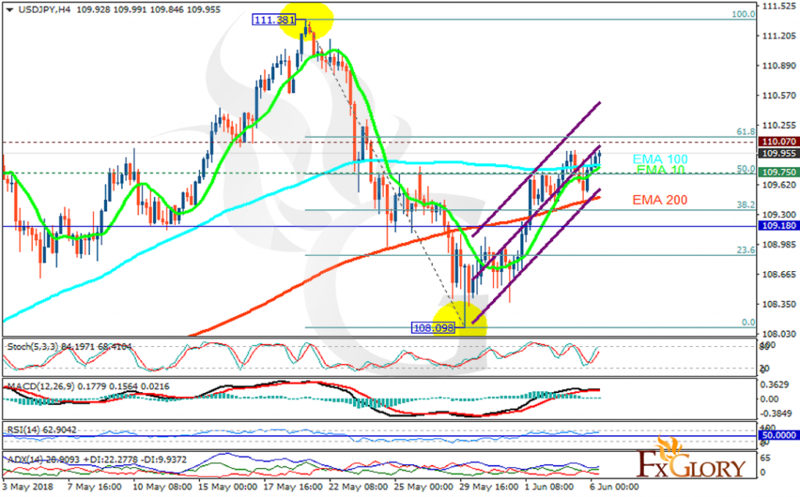 The support rests at 109.750 with resistance at 110.070 which both lines are above the weekly pivot point at 109.180. The EMA of 10 is moving with bullish bias in the ascendant channel and it is below the EMA of 100 and above the EMA of 200. The RSI is moving close to the overbought area, the Stochastic is moving in high ranges and the MACD line is above the signal line in the positive territory. The ADX is showing buy signals. USDJPY will grow towards the 61.8 level of Fibonacci at 110.1 but this level will remain the resistance zone.